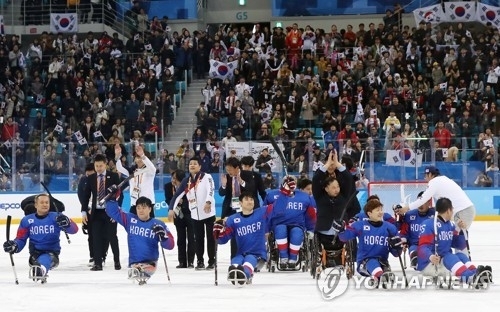 GANGNEUNG, South Korea, March 17 (Yonhap) -- South Korea won the men's ice sledge hockey bronze medal at the PyeongChang Winter Paralympics after beating Italy 1-0 on Saturday. 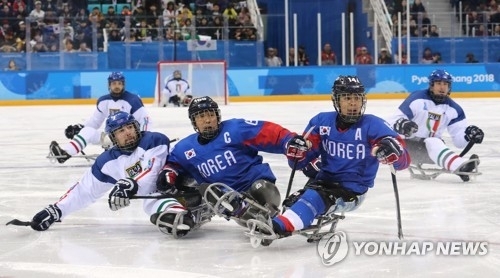 Jang Dong-shin scored the winner to beat Italy at Gangneung Hockey Centre in Gangneung, Gangwon Province, and helped South Korea earn its first ever ice hockey medal at the Winter Paralympic Games. It's also South Korea's third medal at the PyeongChang Paralympics. South Korea reached the last four as the second top performer in Group B with two wins and one loss. The team, however, was trounced 7-0 by Canada in the semifinals. 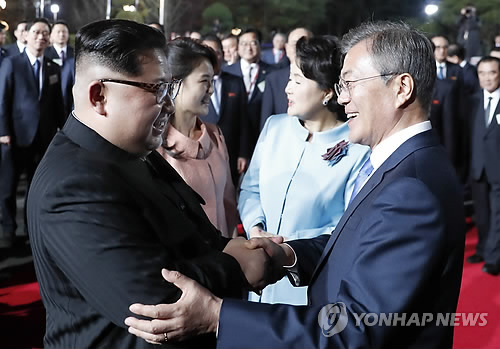 South Korea, supported by a massive home crowd, including South Korean President Moon Jae-in, was aggressive from the start, testing Italian goalie Gabriele Araudo with four shots in the first period. After goalie Lee Jae-woong denied Valerio Corvino's one-on-one opportunity with five minutes remaining in the period, South Korea forwards Jung Seung-hwan and Lee Ju-seung fired shots from close range, but both failed to find the back of the net. In the second period, South Korea kept knocking on Italy's door, and Jung had a promising chance to break the scoreless deadlock at the 10:10 mark, but his attempt was blocked by Araudo. Jang Dong-shin followed with an effort a minute later, only to see his shot miss the target. South Korea allowed a two-minute power play to Italy later after Kim Young-sung committed a holding foul at 5:58 but successfully killed the penalty. South Korea started the third period with Jung's high snap shot just 20 seconds after the whistle. After threatening Italy's defense a couple times, South Korea finally earned its precious goal after Jang redirected Jung's pass at 3:18 into the period. Italy pushed forward to get an equalizer, but South Korea managed to keep its lead to take the bronze medal. "I knew that the puck hit the blade of the sledge, and I actually didn't know if the puck went in the net," Jang said of his goal. "It's the first time ever for us to win a medal at para ice hockey. We were so glad, so moved and excited." South Korean coach Seo Kwang-suk, who showed his tears after the game, said he wants to thank all 17 players for making the glorious moment. "Their sweat, blood and tears from such a difficult environment, coming to this stage with nothing but trust ... the tears are my gratitude for them," he said.